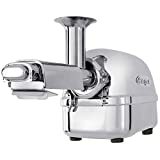 Super Angel 5500 Juicer 2019 Review: Worth The Money? 2014-2015 models have major upgrades to the motor, safety sensor, and main control board. These components have been upgraded and reinforced to comply with U.S. electrical specifications. 1 What Is Interesting About the Super Angel 5500 Juicer? 2 What do reviews of the Super Angel 5500 say? 3 How Does The Super Angel 5500 Compare? 4 Where can I get replacement parts for the Super Angel 5500? 5 Where can I find a used Super Angel 5500 Juicer? 6 What’s The Best Price for the Super Angel 5500 and where can I buy it? love my Super Angel =) get like 2-3x the juice & some studies said 3, 4, 5 times nutrients like magnesium & calcium compared to cheaper masticating juicers. if you juice organic juicing veggies ‘e”ryday’ it pays for itself in like 2.5 months, i figured. after that you’re saving hundreds on a monthly basis. Elizabeth iz smart.